Van Pelt's show is up year-over-year, and also up from the old midnight SportsCenter (excepting post-Monday Night Football shows). 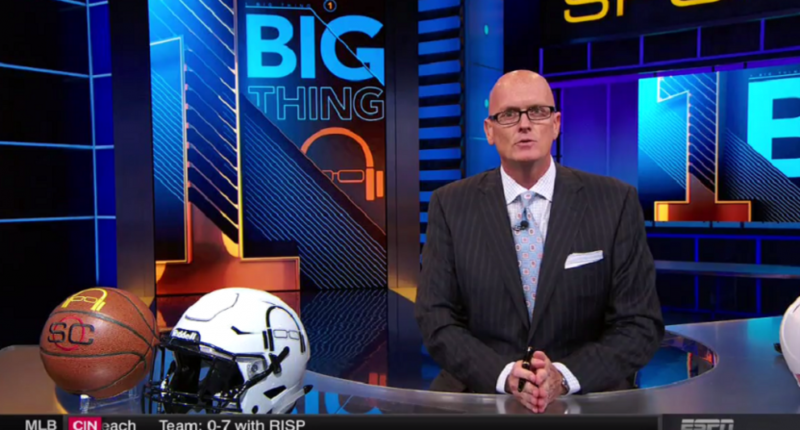 ESPN has extended Scott Van Pelt with another multiyear deal. Van Pelt, who hosts the midnight edition of SportsCenter and also is integral to the network’s golf coverage, is among ESPN’s best-known personalities. He’s also managed to remain controversy-free at a time when the social media minefield continues to ensnare many of his colleagues. His show is routinely the top-rated program among young men in its time slot. For the year, Van Pelt’s SportsCenter is averaging 181,000 male viewers aged 18-34 followed by NBC’s Tonight Show Starring Jimmy Fallon (99,000) and CBS’ Late Show With Stephen Colbert (80,000), which both begin a half-hour earlier, at 11:30 p.m. Van Pelt’s show also is up 20 percent year-over-year among total viewers. This comes as ESPN is reportedly preparing to lay off over 100 workers after Thanksgiving, with the SportsCenter franchise expected to be hit hard. However, big names like Van Pelt were rumored to be safe from those cuts, and this extension further confirms that and is additional evidence that ESPN plans to stick with the midnight SportsCenter for some time to come despite the executive shifts this summer and fall (which saw Connor Schell promoted to overseeing all ESPN content, and Williamson shifting to run SportsCenter, with Rob King moving to head up news, 30 for 30 and more). It makes sense for the midnight show to continue in its current format, though, as it’s shown improvements from the previous non-SVP midnight editions of SportsCenter in overall ratings, not just with that young demographic. Our latest weekly ESPN ratings (for Oct. 16-22) have the midnight SportsCenter pulling in an average of 1,069,000 viewers, 593,000 in the demographic of adults 18-49. This gets its biggest bump from the Monday the 16th show (post-Monday Night Football), which drew 2,337,000 viewers (fourth amongst all ESPN shows that week), 1,221,000 in the 18-49 demo. Two other editions (Friday and Wednesday) cracked the million mark, though, pulling in 1,288,000 and 1,043,000 viewers respectively. We don’t know the specific numbers for the Tuesday, Thursday and Sunday editions, but they would need to draw 582,000 viewers for those other editions on average to hit that weekly ratings average. So, that would give it an average of 815,400 viewers if you exclude Mondays. Back in December 2015, a few months after the launch of SportsCenter with Scott Van Pelt, we discussed John Ourand’s report of how it was averaging 659,000 viewers for Tuesday-Friday episodes from Sept. 7 through Nov. 19, but 3.398 million viewers for Monday episodes in that span. The previous midnight SportsCenter without Van Pelt averaged 712,000 for Tuesday through Friday episodes in a similar span in 2014, and 3.505 million for Monday episodes, so Van Pelt’s ratings were mostly flat from the previous but a little down. The average viewership still changes dramatically from day to day, of course, and that reinforces the importance of a lead-in; any SportsCenter, Van Pelt or no, is going to do much better when it’s coming off a live college football or NBA game on ESPN. But it’s notable that Van Pelt is doing very well in viewership, both with younger viewers and with a year-over-year total viewership rise, and that his show appears to be outperforming the old ESPN midnight SportsCenter (after accounting for Monday Night Football‘s decline). That’s a point in favor of ESPN’s personality-driven SportsCenter strategy, and a point in favor of giving Van Pelt this extension.